Kundapur, Apr 20, 2016: Two under trials who had managed to escape from the Hiriadka prison in January this year were arrested at Tekkkatte by the Kota police. Both the absconding under trials were notorious inter-district thieves who were wanted in nearly 20 cases. 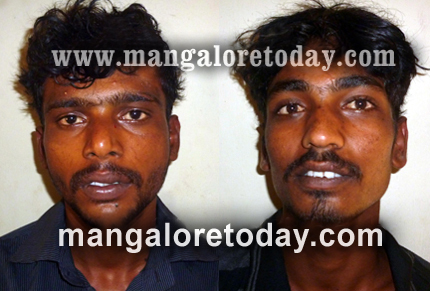 Those arrested are Ashok alias Babru and Kumar Gosavi (23) from Hassan. Police who spotted two men lurking suspiciously near the Hanuman Rice Mill close by the NH 66 at Tekkatte tried to apprehend them when they escaped. The police had to chase them in order to trap them. An iron rod and exo blade was found in their possession. It was only when they were questioned that it came to light that they were the absconding under trials. The duo were staying in some makeshift tents near railway stations or bus stands and used to note down houses where they could commit thefts by moving around in the guise of scrap collectors. The two were first arrested in June 2015 by the Hiriadka police.